It’s mid November already. For many of us, in the US anyway, it’s the month of Thanksgiving and gratitude. Gratitude is November’s theme. A good theme, to be sure. 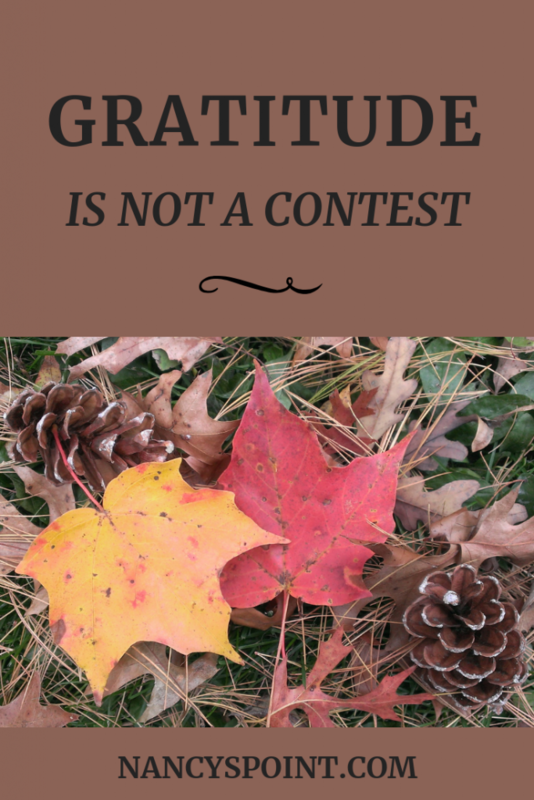 But sometimes, does it seem like gratitude has been turned into some sort of contest? Do you ever feel pressure to feel gratitude in a certain way and feel badly when you don’t? After a cancer diagnosis, some proclaim to appreciate life more. They say they’ve learned to slow down and take time to smell the roses. They’ve learned to prioritize. They’ve learned to appreciate the little things, to stop fretting the small stuff and so on. Are you more grateful since your cancer diagnosis? Some (including me) do not give cancer credit for such a thing. I didn’t need cancer to be a wake-up call. I didn’t need cancer to make me appreciate my life or my family. I appreciated them before. I appreciate them now. Basically, today I am grateful for the same things I was grateful for before cancer. Am I more grateful for these things today? I’m not sure what is accomplished by saying we are more grateful today than yesterday, last year, or before cancer. There is nothing to prove. Gratitude is not a contest. How we look at gratitude, how we feel about it, and how we express ourselves about it varies from person to person, as it should. There is no right way to “do” gratitude either. Like many things, gratitude evolves and fluctuates. It changes as we change, yes, but I cannot will not say cancer made me more grateful. I resist this idea. To me, it feels like yet another attempt to frame cancer as something positive, a gift even. And by now, you know how I feel about that notion. When you were a child, undoubtedly, your parents taught you to say, please and thank you. They most likely worked to instill in you a sense of gratitude. They wanted to teach you good values. This likely started off as you merely learning basic good manners. You learned appreciation for others, for things done for you and for things given to you as well. Over time, gratitude takes on a deeper meaning. Some where along the line, it becomes more than just saying thank you. Cancer or no cancer, gratitude can and should keep evolving. Gratitude takes practice. Gratitude is something you do. This makes sense to me, “doing gratitude,” in other words, practicing gratitude. Since my cancer diagnosis, I try to practice gratitude every day. But I did before as well. Some days I am not successful. But I wasn’t always successful before either. We shouldn’t judge gratitude levels or feel guilty for those days when we don’t feel much gratitude, or at least not as much as we’re “told” we should. And yes, I have days like that. Maybe this is why I resist saying cancer made me more grateful. Perhaps doing so would make it unacceptable for me to have days when I do not feel grateful. I want those days. I need those days from time to time. The important thing is not whether you feel more or less grateful than you once did. The important thing is to feel, nurture and yes, practice gratitude whenever you can, whenever you’re up to it. And if sometimes you’re just not up to it, that’s okay too. 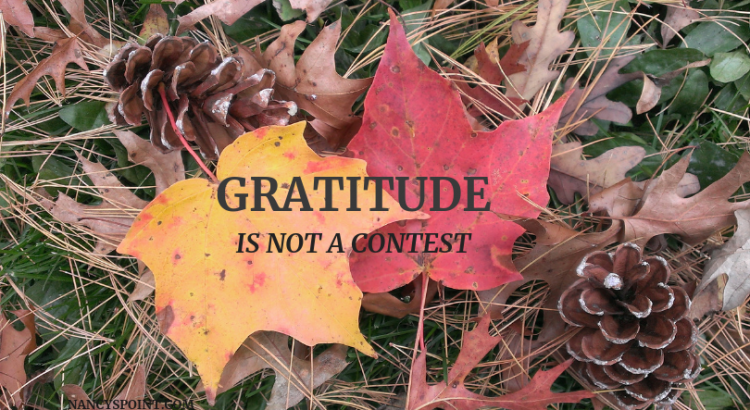 Because gratitude is not a contest. If applicable, do you feel you are more grateful following your cancer diagnosis? Do you ever feel pressured to feel or “do” gratitude a certain way and feel guilty when you don’t? After my diagnosis of Stage 4 ovarian cancer in 2017 I discovered reserves of strength in myself I didn’t know I had. While lay awake in bed, sleepless from steroids , I would think of people I didn’t know but whose deeds and compassion made me grateful for their existence. I like to think that was more than just steroid-fueled euphoria. But I believe I could have experienced this gratitude by surviving an earthquake, car crash, wildfire, or any other life-changing traumatic event. Cancer just happened to be the experience that changed me. At least a natural disaster or accident doesn’t recur over and over. Tanya, Thank you for sharing your insights. I hope you’re doing alright right now. My best to you. I appreciate this discussion very much. It often seems to me that, as hurried and harried as people are, they have a propensity to want things “fixed” now, so they want to hear that you are fine, all is clear, life can go on, and you are grateful to be alive. They have neither the time nor the inclination to hear what the reality really is. Now I am all for gratitude. I have kept a daily gratitude journal for thirty-seven years. But since entering the wilderness of cancer, I have become not less grateful, but more obligated to face unpleasant things and uncertainty head on. I have had to make hard choices, do scary things, endure pains, weakness, fatigue, and misunderstanding, accept limiting circumstances and loss of friends, live with continuing latent effects of treatment. Yes, I notice the good things of life and celebrate them and specialize in active self-care, but I notice the darker things too. The gratitude I continually nurture does not preclude my search for solutions and paths to better health and well-being. It does not diminish my continual emotional fluctuation. It does not mean I don’t still seek the understanding and comfort of those who acknowledge what living in this foreign territory is like. I appreciate places like this where we can give voice to the issues that confront us daily, no matter how grateful we are. Honey Bee, It’s good to hear from you. Your comments are so insightful. You’re so right about being grateful and celebrating all the good things, but that doesn’t mean you don’t notice the dark things as well. This place is totally about giving voice to whatever issues we are facing while being grateful at the same time. You stated that so eloquently. I’m glad you’re part of this place. Thank you for sharing. This really made me think, and thank you for that. I sometimes describe myself as grateful, deeply grateful even. What I mean is that I am grateful that I didn’t die from cancer. I thought I might, but I didn’t and I can only feel grateful for that. There isn’t any other appropriate emotional response in me. But no, I never was grateful for a diagnosis or surgery or the terror that accompanies those things, and I am not grateful that other people go through those things and survive too. And I am not more grateful for life than I was before. I always knew life was precious and fragile and worth whatever it takes to stay alive. And I am not more grateful for my friends. Sometimes I just resent that they don’t get that how hard it is to face a serious diagnosis and their bubbly proclamations that I have a lot to be grateful for! Duh. I know that. Andrea, I always knew life was precious, too, and have always been grateful for my family. Just this morning, I heard an ad for some cancer tx or center on TV in which a woman was saying how post diagnosis she now knows the value of her relationships. Really? I had to change channels. Thank you for reading and commenting. I’m glad the post resonated. “Gratitude is not a contest.” For me, living gratefully is about heading into each day with an open mind and open heart. Gratitude practice doesn’t protect me from the days where my mind will be overwhelmed or my heart a bit broken, but it brings me through those days with a little more energy and a little more hope. I appreciate the idea of gratitude ever evolving and deepening. As always Nancy, a thought provoking post. I am grateful for you and your writing. Thank you! Lisa, I love how you approach gratitude. And I appreciate how you don’t judge others or yourself and how you allow for those overwhelming days and feelings too. Thank you for your kind words. I appreciate your writing too. I appreciate you. VERY thought provoking. I’m thinking that yes, there is a performative aspect to gratitude, much like everything else these days. For the record, I think this pre-dates our social media age, it has merely been amplified by Instagram and Twitter stars with their #blessed stuff. I’m beginning to see gratitude in the same light as the virtue signaling that goes on with “giving” and having the souvenir t-shirt that proclaims to the world: “see I care, I helped, I’m doing things”. As I’ve written on my own blog, I fear gratitude is used as a cudgel against people–to make some of us lower our expectations. It certainly is a feature in our current cultural climate in the US (kneeling NFL debate). Because I can walk and chew gum at the same time, I can also be grateful (and #ImGrateful) simultaneously. I can have 2 sort of conflicting emotions simultaneously as well. I’m an overly complex human, no apologies. And I RESENT the implication, when told to be grateful, that I am somehow NOT grateful, merely because I am also demanding more and better. I’ve been screaming this since I began blogging I think. I wonder what would happen, the next time someone tells me or anyone here, to “be grateful”, if we listed all the ways in which we are grateful and all the ways we’d like improvement. Sadly we live in a time when most people think so many things are mutually exclusive, when in fact they are not. CC, Thanks for reading. I didn’t think it was thaaat thought provoking. lol. I agree about the performance thing. I am even slightly annoyed by the 30-day gratitude challenges in November. I mean, if you want to do that, just do it. Do we all really need to know about it? And yes, we can walk and chew gum at the same time. I can’t figure out why there is so often this boxing in thing that goes on. People are complex and can certainly have many differing feelings going on at the same time. Your point about people thinking so many things are mutually exclusive is spot on. And yes, social media amplifies everything these days. Great insights. Like usual. Thank you. I’ve actually pondered this one quite a bit. My answer is that no – cancer did not make me grateful. I’ve always been grateful for even the little good things in my life. And if it did make me more aware (I’m a little more inclined not to sweat the small stuff these days), I’d honestly trade that insight if it meant not having cancer. But that’s not a choice I got to make, so I’m just content to continue to practice gratitude when I can and also to allow myself to feel scared or sad or angry when I need to. Secret Agent Woman, Sounds like you and I think alike on this one. Thank you for sharing. I have taken a long time thinking about this post. 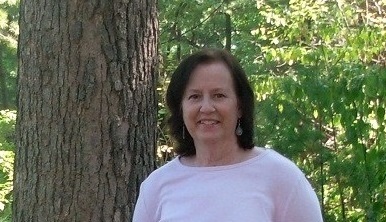 I was diagnosed 5 and a half years ago with stage 4 grade 3 breast cancer. According to the statistics, I shouldn’t even be here. I am grateful for that. It takes a lot of my energy to really say that I am grateful. As you all mentioned, I didnt need this diagnosis to feel that sense of gratitude in my life. I struggle every day with the side effects of my aromatase inhibitors. It’s very tough. We all know what those side effects are. They are ugly. They have taken away my quality of life. I dont do one quarter of the things I used to do. I’m only 55 but feel so very old. Whenever I talk about these side effects there is a little voice that I hear in my head that makes me feel guilty for even talking about the negatives because I should just be grateful to be alive. But that’s simply not enough. I want to be me again and I dont want to feel guilty about not being grateful every minute of every day. It all is a mental struggle all the time. How can I not be eternally grateful for still being alive?! It’s because at the same time AI’s have taken over the life I’ve saved. Lisa, Let me just say, I understand. Completely. Thanks so much for sharing. According to the Recent ASCO Survey Results, What Does the American Public Really Know About Cancer?